Let me begin with this: Preparing horseradish is acutely painful. However, it’s worth it. Commercial prepared horseradish, at least in my area, contains high fructose corn syrup as well as artificial preservatives, neither of which I particularly care for in my diet. It can also be fairly expensive, weighing in around $12 or more per pound. One store in my town carries fresh horseradish roots so we decided we’d try to make it ourselves. It’s not very difficult, just, as I’ve said, painful. 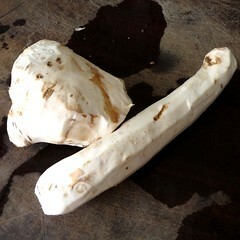 You see, when a horseradish root is whole, it has basically no aroma to it at all. Mine smelled mostly like dirt, being covered quite well with it. Once you damage the cells by peeling or cutting, the fun begins. The enzymes in the cells break down and form mustard oil, which is highly irritative to the eyes and sinuses. If the process is allowed to go on too long before adding vinegar to halt the enzymatic production, horseradish will darken and become bitter. One way you can manage the heat and spiciness of horseradish is by controlling when the vinegar is added. The longer you wait, the spicier it gets (as long as you don’t add it after it begins to darken). Some people pour in the vinegar with the cut pieces of root before grinding it into meal, others wait a bit longer. 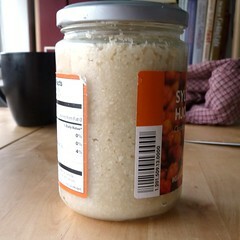 Homemade prepared horseradish is subtler than commercial, at least in my experience. It should be used sparingly as it packs a bigger punch. As for how to use it, well, I’ve used it on bratwursts, steaks, fish, as well as in salads, such as beet-apple-walnut salad. Plus I will be making some compound butter and creamy sauces from it later this season. A little goes a long way! In a food processor fitted with the metal chopping blade, combine all ingredients. 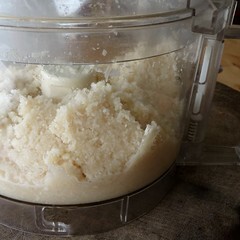 Process until the horseradish is finely ground. In a well-ventilated area, pack horseradish into glass jars that can be tightly sealed. Refrigerate for up to 6 months. 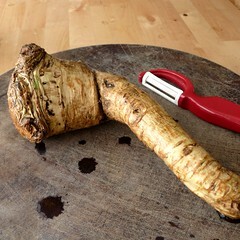 If horseradish darkens and develops a bitter taste, throw it out. This entry was posted in dairy-free, gluten-free, Preserving, recipes, untranslated, vegan, vegetable, vegetarian. Bookmark the permalink. Thanks so much for this post. I have some horseradish growing in a corner of our garden but have never known how to process it, nor (and more importantly) what the principle is behind the method. Good stuff! The beet-apple-walnut salad sounds interesting too – perhaps you could post the recipe some day? For red horseradish which will be more edible prepare with beets, raw or cooked (peel after cooking). also, if you grow in the garder, this is a killer will spread all over, should be growing controlled .